Citrine is referred to as the stone of success. It is the color yellow, which is the color of the solar plexus chakra.That is the energy center or “Chakra” which is the seat of emotional and material power. Citrine Crystals are a kind of quartz and are closely related to Amethyst. As a matter of fact, most of the Citrine on the market began as Amethyst and was heated to become the yellow color. However, in some Amethyst deposits, the Amethyst has been partially or fully changed over to yellow Citrine by completely natural means of heating. That is how all gemstones are created in Nature. It has been found in many countries including France, Britain, and the USA . The true gem quality Citrine is extremely rare. The best gemstones are found in Brazil, Spain, Madagascar and the former USSR. Its name is derived from the Greek word meaning ‘citron’ because it is commonly of a color similar to the citrus fruit of that name. Sometimes Citrine has a “smoky” shade to it, and the natural Citrine stone may often look like pale Smokey Quartz crystals. It is said to have different metaphysical qualities than the brighter version of manufactured heat treated Citrine stone. Natural light yellow Citrine is often termed “Lemon Quartz” on the gemstone market. The natural version is adopted for both manifestation and healing, whereas the brighter version is useful for enhancing creative abilities. It is the birthstone of November and June. Yellow Topaz and Citrine are both Quartz crystals, though in origin completely different ones, and they are both utilized as the birthstone for November. Yellow is associated with the number 6 and the astrological signs of Gemini, Aries, Libra and Leo. Citrine can bring happiness, joy and optimism in your life and also aid in transforming negative energies. It can help one deal with the day to day organization of activities and bring order to one’s life. It can be especially useful for those initiating a new business or some other new activity in life. It reduces the fear and anxiety associated with change and can help enhance prosperity and abundance. Citrine also promotes generosity and a share the wealth mentality. To attract abundance, it has been suggested to put a citrine gemstone it in the cash register of a new shop. It is a stone that brings happiness and cheer to one who holds it. Emotionally, citrine can relieve depression and self-doubt by eliminating the fear caused by others’ negative ideas. It can also help release anger, irrational mood swings, and self-destructive behavior. It can also assist in getting over emotional traumas and grief. Another aspect of this gemstone is to enhance sensuality and sexuality. As far as the psychic and spiritual energetic properties are concerned, citrine is said to heighten psychic awareness and help increase spiritual development. It can aid in meditation, and is also excellent for dream recall and dream work because it helps to unclutter the mind, and clears away negative energies and influences. On a physical level, Citrine is said to aid in the digestion, stomach, sleep disturbances, thyroid, heart, kidney, liver, muscles, strength, endocrine system, circulatory system, tissue regeneration, urinary system, immune system, diabetes, fibromyalgia. Very importantly, it is also beneficial in removing toxins, and eliminating addictions. I have designed several bracelets and necklaces with citrine, so please feel free to visit my website where you can browse or purchase my jewelry creations designed with specific energetic properties in mind! Aquamarine has many incredible properties other than just being outrageously beautiful! Jewelry has always been created for both men and women, and gemstones have been used since ancient times not only as adornments but very often used for healing diseases, of both the mental and physical categories. Throughout history, gemstones have been valued for their mystical and healing powers. Aquamarine is a blue gemstone from the Beryl family, and can be found in the USA, Mexico, USSR, Brazil, and India. It is also seen in a yellow color as well, but is best known as a pale blue gem. It is the birthstone of March, and is a perfect stone to help one to communicate well. It inspires service to humanity, lightheartedness and creativity. Gemstones were worn as charms by the ancient Romans, who were credulous of their magical and healing powers, and even now they are utilized as healing agents. Historically documented, it has been used as a cure for many varied afflictions. Pliney the Elder, who was killed in the eruption of Pompeii in 79 AD, noted in his “Natural History”, that it can be used as a wash for maladies of the eye, and drunk in remedies where an Aquamarine gemstone was immersed in water. It was used as a powder for many other various illnesses as well. This lovely gem reminds one of the sea in both its name and its color. It is clear light blue and pale blue-green, and the ancients believed in Aquamarine as a stone of courage and serenity . It was thought that carrying it would help them to return safe and prosperous from all sea voyages, and it was believed to aid sea sickness. Interestingly enough, it was once utilized to make eyeglasses. When the Germans first began making eyeglasses, slices of aquamarine were used as the lenses for nearsightedness. The early lenses were still cloudy until manufacturing developed and flint was added to make the glass clearer, but after supplies ended in Europe and Russia, around the 1700’s, rock (quartz, beryl, or pebble) crystal, mined in Brazil and Argentina, was used because this material was more substantial than regular glass. As to the physical healing aspects, it has a tonic influence on the body, as all blue gemstones do. It can assist in cleansing the body of toxins in the liver, kidneys, thyroid and spleen. It is good for the throat, the center of expression and communication, the immune system and the heart. Spiritually, it is said to be the color of Divine Knowledge, with the eternal blue of the ocean and the sky. It can bring the peace and facilitate commune with the Nature Spirits, and was said to be given to mankind by the mermaids in a treasure chest. Aquamarine can be useful for teachers, public speakers, and also those who communicate through therapeutic practices, such as massage therapists and chiropractors. It calms nervous tension, clarifies perception, and quiets the mind so as to facilitate meditation. It can filter out unnecessary information in the brain, reducing stress levels and can help one to attune better to Nature and enjoy the peaceful moments that life can offer if one becomes more attuned to them. I offer some Aquamarine jewelry creations on my website , and hope you will take a look! communication and even out of body travel, for those so inclined. Angelite or Blue Anhydrite was discovered in 1987 in Peru, and is a fairly new discovery in the gem and mineral world. also are found in Madagascar. It is mined in Britain, Egypt, Germany, Mexico, Poland, Libya. Healers all over the world are still uncovering its numerous and astounding energetic properties. The colors can vary between white, gray or colorless, to light blue and even lilac and violet. There are many very beneficial properties of this gemstone. It can help one to be more compassionate and accepting, especially of things that cannot be changed. feelings of peace and tranquillity. reducing inflammation and balancing the thyroid and the parathyroid. Angelite is also believed to help reduce pain. It has helped recover from back injuries, broken bones and generally pain of any kind. Hold a Angelite stone when feeling stressed and overwhelmed, the soft vibration will allow you to immediately relax. color blue is the color of the 5th chakra (of the bodie’s 7 energy centers called chakras), which is the throat center. Light blue is color of creative expression and communication. Symbolically this color stands for freedom and intelligence linked with feeling. Mentally, this color is associated with the ability to trust your intuition and to make changes with greater ease. necessity for peace, calmness and the courage of self expression. The energies of light blue can encourage you on your journey of personal growth. Numerology, it vibrates to the number one. The number one is about leadership and following your ideal path in this lifetime. It can be kept on the bedside table or worn as jewelry. with your spirit guides, angels, archangels and other spirit forms. It is said that Angelite assists with communication with those beings, and with loved ones. I have created several necklaces with this beautiful gemstone, because I love its color and also the properties that I learned that it holds. They are truly angelic in nature and well, I guess we can all use some angelic help, even if it comes from simply enjoying the beauty of a gemstone! Turquoise has been utilized by many civilizations, its been found in artifacts in Persia dating from 5000 BC. There is much superstition and folklore about turquoise, for instance, it was said that if the stone changed color it was bad luck. A thousand years ago, the Anasasi people of Chaco Canyon in the American Southwest began mining it in and used it in trade, and it has become an important part of American Indian culture. The Zuni believed it protected them from demons, the Apaches believed it helped them in war and battles, the Navajos used it in rainmaking ceremonies. The name is derived from the European trade origins, meaning “Turkish stone”. Shakespeare wrote about it in the merchant of Venice. It was believed in Europe that Turquoise protected horses and riders from accidents and falls during travel. Turquoise is a stone of peace, serenity and tranquility. It increases protection, meditation energy, wisdom, balance, honest communication, strength, friendship and love. It shields the wearer from harmful influences, attracts friendship. Healing with Turquoise can benefit the whole body, especially for the immune, respiratory, waste and skeletal systems. It has been recommended for use in detoxification of alcohol, poison, pollution or radiation in the body, and also to treat high blood pressure, asthma, infections, and dental problems. Turquoise can also aid in communication issues, including fear of public speaking. Mentally, it can restore and promote serenity, creativity, empathy, positive thinking, sensitivity, intuition, happiness wisdom all of which result in a calmer state that leads to greater self-realization. The color turquoise is also very healing, all colors have special and specific energy properties inherent in the color ray itself, which enhances the energy of the gemstone. This color has more emphasis on feelings and creativity than with rational thought. The range in color between greens and blues, and various shades of turquoise, blue green and or aqua relate to transformation, evolution, change, transmutation, the inner teacher, and the spiritual heart. I have created two new necklaces with turquoise and the turquoise color agate, which I believe can be not only beautiful additions to one’s accessory collection, but very healing and inspirational as well. Crystals have been used throughout time in many beneficial aspects. Rock Crystal is quartz crystal, and comes in a wonderful variety of colors. It is a symbol of chastity, purity of thoughts, innocence, modesty and fidelity. Crystals emit electromagnetic waves into the environment and are thought to bring vibrations and resonance to the human body. Perhaps crystals can help us to “vibrate” in a positive manner enhancing the wellness state that our bodies naturally gravitate to. It certainly is worth experimenting with this idea. 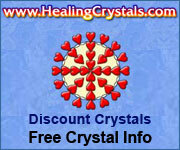 There are many different species of crystals used in what is now known as crystal therapy. Colors range from Clear, White, Pink, Brown, Gray, Black, Green, Blue, Orange, Purple (Amethyst), Yellow (Citrine), Each quartz emits its own color, frequency and healing properties. Known as the “Stone of Love”. Rose Quartz soothes, comforts & reassures, bringing about deep inner healing. Gently removes negativity & attracts the energy of love bringing peacefulness & calm to relationship. Quartz crystals are used in expanding the mind to touch the spirit world. Crystals are used to enhance the beneficial life force. Crystal water (water that a quartz crystal has been placed) has been drunk for its healthy benefits for centuries. Some people think crystals are new age. How can something that has been used since cave-living man be new age? It is said of quartz that it can enhance energy by absorbing, storing, amplifying, balancing, focusing and transmitting it. In other words it is said to channel universal energy, which is all around us. Therefore quartz also can enhance thoughts, as they are a form of energy. Because it can be used to direct and amplify energy, it can be extremely beneficial for manifesting, healing, meditation, protection, and channeling. Dr. Shelly Kaehr, PH.D, has written a very interesting and informative book called Edgar Cayce Guide to Gemstones, Minerals, and More. Edgar Cayce gave many readings and discourses on the benefits of gemstones, and Dr. Kaehr has included them in her esoterically oriented but scientifically based book. Edgar Cayce, called the Sleeping Prophet, assisted by his loyal stenographer, Gladys Davis, recorded over 14,000 psychic readings. In all these readings, he recommended gemstones more than a hundred times to his clients. It has been said Atlantis was destroyed by the incorrect use of quartz crystals. Edgar Cayce spoke about an energy stone in Atlantis. Mr. Cayce’s description of the energy stone fits quartz crystal. Dr. Kaehr also has studied what are termed as Lemurian Seed Crystals, which have a distinctive horizontal striations or groove formations. She says that these crystals can unlock a wealth of information to the person holding them. Each of these grooves represents a different era of time. They are records that hold information the way rings of tree trunks tell you the age of the tree. She says that when you hold one of these crystals, you receive information at a deep subconscious level, and that these crystals are now being found all over the world because the information they hold is valuable to us all at this time. I really like the idea that a crystals can unlock and transmit energy and reveal information. Perhaps the idea alone brings one to reflection and thus insight. They are so beautiful to wear or to have on display in the home, that their presence seems to speak to you, whether they are simple prisms bringing a rainbow into your home, or a Lemurian Seed Crystal revealing its secrets!